The traditional curtain-raiser for the English Premier League is the FA Community Shield, a charity match between last season’s champions and the current FA Cup holders. 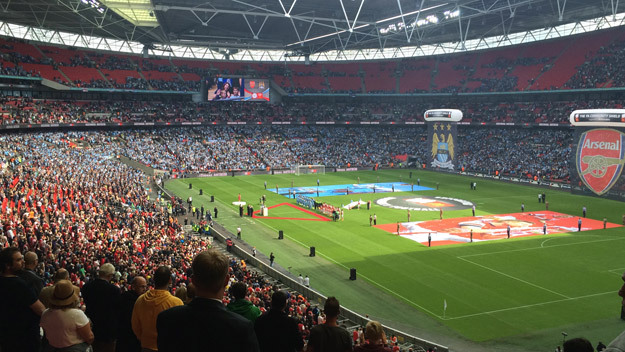 This year saw champions Manchester City play cup holders Arsenal in a hotly-anticipated showdown in glorious Wembley sunshine. AJTF were honoured to be part of this 92nd staging of the match by fabricating the large printed PVC centre circle banner used as part of the pre-match presentations. For trivia fans, this match represented the very first time that vanishing spray was used in a competitive match in England after successful trials during the 2014 World Cup. For the record, Arsenal won the match 3-0.